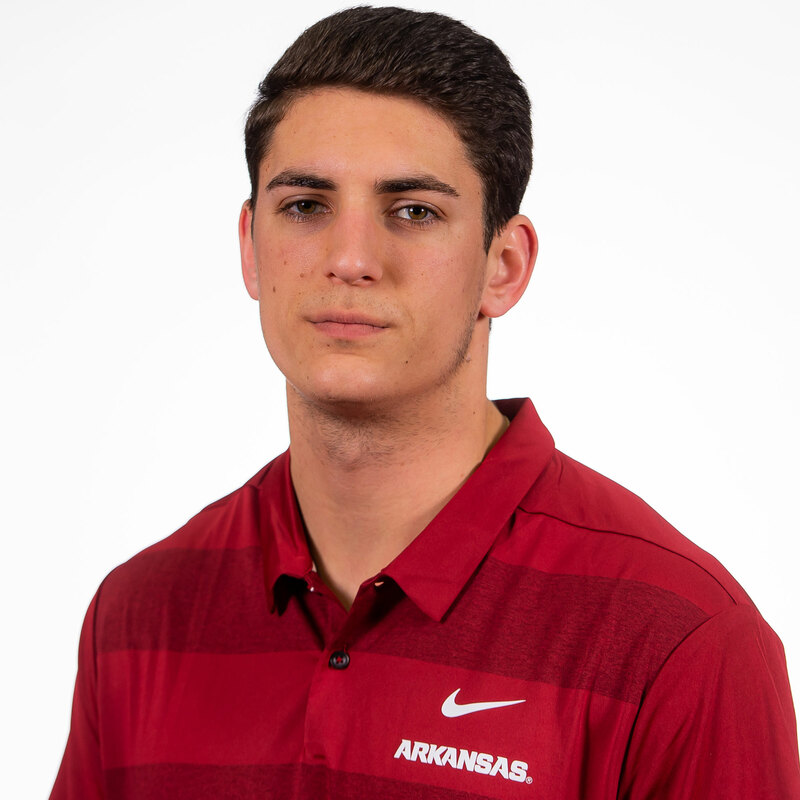 2018 (JUNIOR):Played in all 12 games as a junior for the Razorbacks as the team’s primary kicker … Semifinalist for the Lou Groza Award, presented annually to the nation’s top kicker … Participated in 114 plays, 54 field goal/extra point snaps and 60 kickoff plays, according to Pro Football Focus … Connected on 19-of-24 in field goal attempts of the course of the season, good for 79.2 percent … His clip is tied for sixth-best in a season by a Razorback, even with Bruce Lahay in 1981, who also put together a 19-24 mark … The 19 field goals also matched Lahay & Steve Little’s (1977) for fourth-most in a single season by an Arkansas kicker … Put together a streak of 10-straight field goal attempts made from Sept. 22-Oct. 27, the third-longest in school history … Opened the season with a 2-for-2 day against Eastern Illinois and followed it up with two more made on the road at Colorado State on Sept. 8 … Hit a career-long 54-yard field goal against North Texas on Sept. 15 … Began his streak of 10-straight made after connecting on his second of the game from 29 yards out … Posted 40+ yard FGM in each of the next two games vs. Texas A&M and Alabama, launching from 47 and 41 yards, respectively … Made all four of his field goals against Ole Miss on a cold, rainy night in Little Rock on Oct. 13 … Connected on kicks from 43, 38, 38 and 36 yards against the Rebels to become the first Razorback since Alex Tejada in 2007 to go 4-for-4 in a game … It was tied for the third-most FGM in a game, just behind five set twice by Kendall Trainor in 1988 … Followed up his Ole Miss performance with three consecutive field goals against Tulsa to improve his streak to 10 … Lost his streak on what would’ve been the third-longest FG in Arkansas history with a miss from 60 yards against Vanderbilt the following week, but entered the record books by nailing a 55-yarder later in contest for the No. 7 kick in school history … The field goal made him the first Razorback kicker with multiple 50-yard FGs made in a season since Zack Hocker in 2013 (53, 51, 54) … Perfect 29-29 in extra point attempts in 2018 … Received an 86.0 grade from PFF in field goal kicking for his performance as a junior … Led the team in scoring with 86 points. 2017 (SOPHOMORE): Converted 8 of 9 field-goal attempts … Longest made kick was from 48 yards out … Perfect from 30-39 yards, making all five attempts … Only miss was a 44-yard attempt on the road at Ole Miss (Oct. 28) … Served as the team’s kickoff specialist and was responsible for all 66 kickoffs … Averaged 60.7 yards per kickoff with 21 touchbacks … at South Carolina (Oct. 7): Converted from 48 yards out on his first field-goal attempt of the season … at No. 1 Alabama (Oct. 14): Connected on a 30-yard field-goal attempt … vs. No. 21 Auburn (Oct. 21): Made field-goal attempts from 34 and 38 yards out … at Ole Miss (Oct. 28): After missing a 44-yard attempt earlier in the game, clinched the victory with a 34-yard field goal with four seconds remaining … He made his first three attempts at the game winner but Ole Miss called three timeouts, negating those … It was the Razorbacks’ first game-winning field goal since Alex Tejada booted a 37-yarder against East Carolina in the 2010 Liberty Bowl … vs. Coastal Carolina (Nov. 4): Made his lone field-goal attempt from 46 yards out … at No. 24 LSU (Nov. 11): Booted through a 38-yard field-goal attempt … vs. Missouri (Nov. 24): Nailed a 42-yard field-goal attempt in the season finale … Ended the year with four straight field-goal makes. 2016 (FRESHMAN): Served as the team’s primary kickoff specialist … Kicked off 43 times for 2,656 yards in nine games … Nine of his kickoffs were touchbacks. HIGH SCHOOL: Ranked the No. 35 kicker in the class by ESPN with a grade of 73 … A four-year letter winner at Allen High School under head coach Tom Westerberg … As a senior, earned All-County first team special teams honors, was named to the All-District 6A second team and was selected as a Kohl’s High School All-American honorable mention … Helped the Eagles to a 14-1 record and the Texas 6A D1 state semifinals … Made 84 of 87 PAT attempts for a conversion rate of 96.55 … Booted through 19 of 24 field goals with a long of 48 … As a junior, converted seven of seven PAT attempts … Made 28 of 31 PAT attempts and one of four field goal attempts as a sophomore … In his freshman season, made 36 of 43 PAT attempts and three of four field goals. PERSONAL: Born on Oct. 17, 1997 … Son of Lisa and the late Scott Limpert … Has one sister, Nicole … Recreation and sport management major.